Another plant which can be used to cure erectile dysfunction problem, namely 'Talinum paniculatum' or be in Indonesia, known by the name of Som Java. Som Jawa it actually comes from the U.S. southeast and south. Beefy thick root and is usually used as a substitute for ginseng. On the island of Java, this plant grows in height of 5-1250 meters above sea level. This plant can grow to 30 - 60 cm. bar at the bottom of the fork and it’s root word is crust. Single leaf, located opposite, and spired. 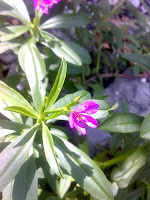 flowers that is bloom in the afternoon, look in a red purple color. The morphology of som jawa plant roots is very similar to ginseng (panax pseudo ginseng, or panax ginseng), which comes from the Chinese and has long been used to cure erectile dysfunction. therefore the plant is also often referred to as the Javanese Ginseng (Javanese ginseng). Chemical compound that belongs to Som Jawa, are: saponin, flavonoid, tannin, and steroid. In addition, potassium also has a degree, Na, calcium, magnesium and Fe. This plant is known to increase fertility and can be used as a Natural Viagra. This has been proven scientifically by using the male as mencit animal experiment, to find out the relation between Som Jawa (Talinum paniculatum) with health spermatozoa. Research shows that the extract som jawa percentage can increase the number of spermatozoa with normal morphology and motilities type A. In conclusion, the higher dose of extract given som jawa, can maintain the number of spermatogenesis cells, morphology, and thus prevent motilities on infertilities men. 50 grams of the root of som jawa sliced thin. Add with 3 / 4 cup of hot water. Add a little rice wine. Drink while warm. To get the maximum property of the root, this plant should be aged at least 7 months to 1 year. The fresh root is used as a medicine, it is first steamed dried ago that can be stored in the time period long enough. Use fresh roots can directly cause diarrhea which is caused by sap from the root of Som Jawa. Som Jawa fresh leaves can be harvested when the plant reaches the age of 3 to 6 months. Has done a scientific test to determine the security of the use of this plant. Results from research that toxicities test, the plant is safe for consumption. To cure ulcer, is quite simple. Take fresh leaves Som Jawa. Wash cleanly and pound it until smooth. Then paste the boil that has been cleaned beforehand. Then bandage that section. Use of the empirical plant proves that this is very useful to facilitates breast feeding. Take a leaf of fresh Som Jawa, then prepared by frying and then boiling in oil and spices, and being eaten as vegetables. In addition to improving care, this plant can also make healthy body, and increase appetite. Som Jawa plants (Talinum paniculatum) can be planted trough stek the stem or branch that measuring 12 cm long. Stek seeds from the stem (the tip, middle or bottom) can be planted directly in the garden. Can also use the seed or cross pollination of their own. Som Jawa grow in the fertile sandy loam, sandy soil and is quite loose (much humus or organic material). Light intensity required 75%. fertilization using organic fertilizer. Sprinkling rare, not too much water.